This saffron-infused Seafood Paella is loaded with mussels, clams, and shrimp. Cook it on the grill for best flavor. 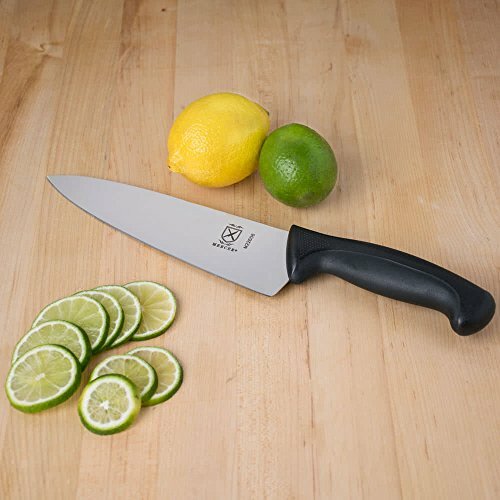 It serves a crowd and would be so much fun for your next cookout! Are you ready for a party? Mix up a pitcher of sangria and call your friends and neighbors! A festive occasion calls for a big statement, and this paella is just that: a colorful rice dish bursting with clams, mussels and shrimp along with smoky chorizo and saffron for tons of flavor. You don’t need much else to serve alongside it, but you could make a green salad if you feel inspired. Set the whole pan of paella on your picnic table, and bring out some crusty bread and wine glasses. Summer is just too short not to celebrate it with friends. The origins of paella are ancient, rooted in the area around Valencia, Spain near the Albufera Lagoon, where both fishing and rice growing dominated the region for centuries. Paella was the food of farm workers who cooked dishes of rice over wood fires, embellished with whatever ingredients they could find. The dish is named for the wide, shallow pan in which the paella is cooked. The word “paella” is from a Valencian dialect meaning “pan,” probably derived from the Latin word “patella” for pan. 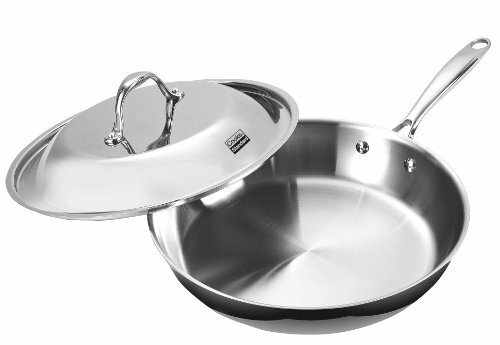 DO I NEED A PAELLA PAN? While you can buy a paella pan and even a special outdoor paella grill for cooking it, it’s easy enough to adapt the traditional paella method to our home kitchens without a lot of extra fuss. Since I don’t possess a paella pan, I used the largest sturdy skillet in my collection of pans. A cast iron pan would be ideal but mine was not big enough and I found my heavy skillet worked just fine. Lacking a large skillet, you could also use a medium-size roasting pan (approximately 14 X 10 inches). Although you can cook paella entirely indoors on top of the stove, when you consider paella’s wood-fired origins, it makes total sense to cook it outside on the grill. For this recipe, I started it on the stove indoors while the grill heated, and then finished it on the grill. Even, steady, medium heat is the goal. Paella is the mother of all the one-pot meals, so it makes a supreme party dish. Improvisation rules the day, since even in Spain the issue of what ingredients should go in paella is hotly disputed, making it impossible for foreigners, let alone Spaniards, to dictate them strictly. Paella is essentially a rice dish, and the type of rice does make a difference. 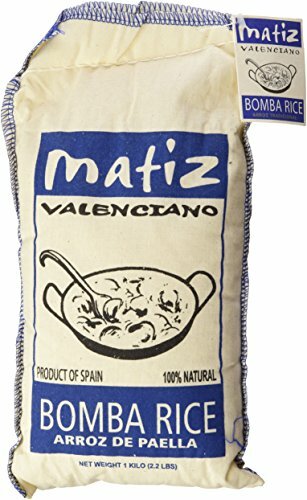 Spanish bomba rice, a medium-grained stubby rice that absorbs liquid well but maintains some firmness when it cooks, is preferred. Since it is hard to find and pricey, you can substitute Italian Carnaroli, Calrose, or another short-grain rice. The crispy bits! Once the stock comes to a simmer, don’t stir it. As the paella cooks, the rice stays on the bottom and forms a crusty golden bottom layer in the finished dish. This crust of rice is called socarrat and is coveted by true paella lovers. The vegetables rise to the top while cooking. For this seafood paella, you can use fish stock if you like and if you can find a good source for it, but I actually prefer chicken stock. It adds a depth of flavor, and as the shellfish cook, you get plenty of sweet, briny juices to flavor the rice. Be sure to taste the stock and season it with salt if necessary. Saffron is a key ingredient, too. These orange-red threads are actually the dried stigmas of crocus flowers. Crumbled into a pot of hot stock, saffron adds an earthy, floral, and somewhat mysterious flavor to your paella. It imbues the rice with a gorgeous golden color, too. Saffron is a fairly expensive spice, but thankfully you only need a few threads to season a whole dish of paella. It also keeps for a fairly long time as long if it’s stored in an airtight container and kept out of direct sunlight, so you don’t need to worry about using up your extra saffron right away. Most well-stocked grocery stores should carry saffron, such as Whole Foods or Trader Joe’s. Look for it in the spice section. Paella starts with a sofrito—finely chopped onions, garlic, and tomatoes or red peppers sautéed gently in olive oil. It is akin to the Italian soffrito or French mirepoix. Sofrito lays the groundwork for all the flavors in the dish to mingle; think of it as priming a canvas before making a painting. I chose shrimp, clams, and mussels for this seafood version of paella, and Spanish dry-cured chorizo for its smoky, meaty flavor. You can substitute other cooked sausages if you like, and add some smoked paprika to taste to achieve the desired flavor. Thoroughly scrub the clams and mussels before cooking and discard any with cracked or broken shells. MORE SPANISH RECIPES TO TRY! If you have trouble finding Spanish chorizo, substitute another kind of cooked sausage along with 1 teaspoon of smoked paprika (for the smoky flavor). No grill? Cook this inside! Cook the paella through step 6 on top of the stove. Preheat the oven to 350°F. Add the seafood (step 7), cover the pan tightly with foil and finish cooking in the oven for 6 to 10 minutes or until the rice and shrimp are both cooked through and the mussels and clams are open. Check to see if the bottom has browned and, if not, set the pan over medium heat for a minute or two to allow the bottom layer of rice to caramelize. 1 Preheat the grill: Heat a gas grill to medium-high heat (375ºF), or light a charcoal grill and let burn until the charcoal is covered with gray ash. 2 Steep the saffron: In a saucepan over medium heat, bring the stock to a boil. Add the saffron and salt. Turn off the heat and let the saffron steep for at least 15 minutes. Taste and add more salt, if needed. 3 Cook the sofrito base: In a 12- to 14-inch stainless steel skillet or cast iron pan, heat the oil over medium heat on top of the stove. Add the onion and red pepper, and cook for 5 to 7 minutes, or until the onion is translucent. Stir in the garlic and chorizo. 4 Assemble the ingredients by the grill: On a table next to the grill, set the skillet with the sofrito, the rice, tomatoes, infused stock, salt, peas, shrimp, mussels, and clams. 5 Begin cooking the paella: Set the skillet with the sofrito on the grill. Add the rice, and cook, stirring often, for 4 to 5 minutes, or until the rice is coated with oil and lightly toasted. Stir in the stock, tomatoes, and peas. Taste for seasoning and add more salt, if you like. Spread the rice evenly over the bottom of the pan. Close the grill cover and simmer the rice without stirring for 15 minutes, or until the rice absorbs most of the stock. If the mixture looks dry, pour about 1 cup of hot water over it, but do not stir. 6 Add the seafood: Nestle the mussels and clams into the rice with the hinge sides up so they release their juices into the rice. Arrange the shrimp around the shellfish. 7 Check to see if the bottom is browned: Slip a spatula under the rice and check to see if you have achieved the elusive golden brown socarrat. If not, set the pan over the heat, uncovered, for a few minutes to lightly caramelize the bottom. Sprinkle with parsley and bring the whole pan to the table for serving. Hello! All photos and content are copyright protected. Please do not use our photos without prior written permission. If you wish to republish this recipe, please rewrite the recipe in your own unique words and link back to Seafood Paella on Simply Recipes. Thank you! This was fantastic—right down to the socarrat! I did it all in a 12-inch skillet on the stovetop. Great directions to make one of greatest dishes out there! I made this last night and was so pleased with the result. The most important part of paella is the rice, and this recipe delivered—even describing how to achieve the socarrat at the bottom of the pan! I did everything on the stovetop, thanks to the clear instructions! This is the recipe that I will be using from now on. Thank you for the great recipes—you are a trusted, reliable source for me! Would Jasmine rice work in this recipe? Hi, Christine! Jasmine will give you a somewhat different texture and flavor than traditional bomba rice, but I think it would still work. Let us know if you try it! I have wanted to try cooking paella for years! I’ve read umpteen recipes and watched videos. But still too intimidated. Not sure if I should buy a paella pan, etc. But reading this today, there is something especially accessible about this well-written recipe and all the wonderful explanations and photos — it makes me believe I can do this. Thank you, Sally!! Thank you Annie! I hope you try this–it just isn’t that hard and it’s a really fun party dish–you definitely can do this!